The C&O Restaurant opened it’s doors in 1976. From the beginning the restaurant enjoyed high praise from some of the nations most notable food writers and critics. The C&O staff is peppered with enthusiastic crafts people who are passionate about their work. The kitchen crew works tirelessly cultivating relationships with local farmers, cheese makers, vintners and ranchers bringing you the best of what’s around. The waitstaff is knowledgeable, attentive but unobtrusive, with a keen eye towards warmth and hospitality. The C&O is a multifaceted restaurant with six different areas for dining. The Upstairs dining room is surrounded by windows that look out over the former C&O rail yard and passenger station. During the Depression the room was used as a bunk house for the men who worked on the railroad between Charlottesville and Clifton Forge. The Mezzanine is cozily snuggled between the two historic buildings that comprise the C&O restaurant. The nearly century old brick and barn wood floor give this room its rustic old world charm. When you first enter the C&O you will be standing on the mezzanine, greeted by our Tulikivi wood stove and one of our knowledgeable staff. 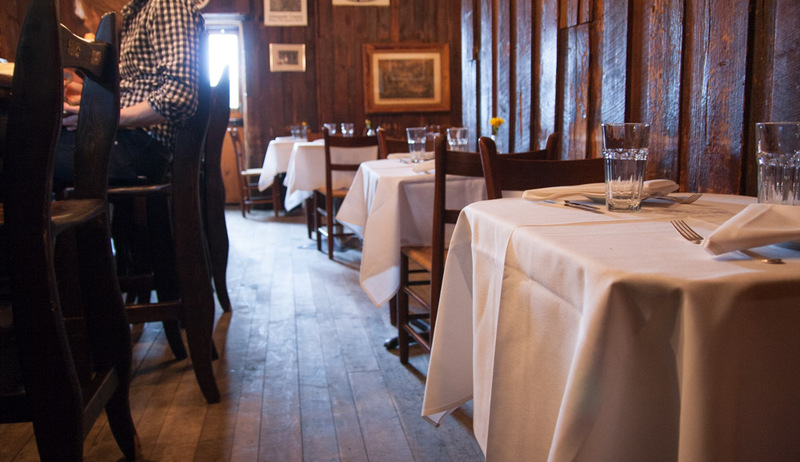 The Bistro, once referred to by a local writer as “one of the greatest rooms in America”, is modeled after the bar rooms of central Europe and is a favorite of locals and UVA alumni. The old world feel of the bistro and its woody charm come from the craftsmanship of our friend and artisan woodworker, Barry Umberger. Much of the room was constructed using reclaimed wood from a barn dismantled in Albemarle County in the early 1970’s. The crisp white linens offer a stark contrast to the rustic wood. The Terrace is a summertime favorite. Hidden away from the walking traffic of downtown, the terrace provides a tranquil outdoor dining experience. Under dramatic torches, intimate amber lighting, and the stars in the night sky, everyone looks beautiful. The Patio is a relatively small outside dining area featuring hand made Italian tile tables. Under the cover of a rainproof awning, enjoy al fresco dining protected from spring showers and summer storms. The C&O Gallery is primarily used for private events and has it’s own separate entrance to the left of the main restaurant. The space is versatile and can be arranged to accommodate intimate and convivial cocktail receptions or formal sit-down dinners.